November's Over - Now What? November was National Adoption Awareness Month and I have LOVED reading all the stories that have been highlighted these last few weeks. But now that December is here, the work in orphan care and prevention must continue even after the spotlight is gone. I want to encourage you to continue reading about Adoption and Foster Care and how to support adoptive families. 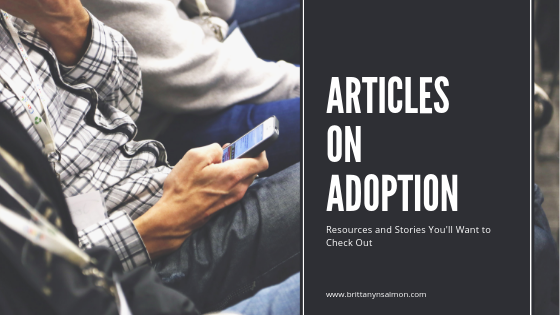 In order to help, here are some articles that I think are really valuable to the conversation surrounding adoption. Some were written by friends, others by me, but hopefully all of them will help you in learning more about adoption. The last few links are to videos produced by an organization I highly respect called BraveLove - if you click on nothing else, at least watch these videos. My hope is that this list will be a blessing to you and help motivate you to help continue the work year-round! Posted on November 30, 2018 by The Sassy Salmon.